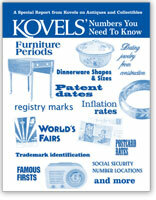 These guides contain all the information you need to identify the hard-to-decode marks on modern ceramics (pottery & porcelain). It covers pieces by art and studio potters, factory-made everyday pottery, designers and importers from many countries with photos, history and marks. 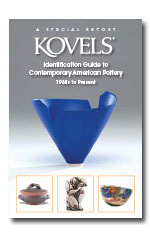 A Kovels’ exclusive reference guide to undiscovered American contemporary pottery, 1960-present. Each pottery is listed with a description of its work, years of productions, dates, color pictures of the pottery and the manufacturers marks. 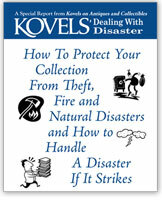 Filled with information not easily found that helps identify the most sought-after collectible pottery.